“What would you do with an extra day holiday?” – We designed a popular and memorable employee communication pack to help Hilton roll out their new benefits programme to 80 locations across the UK. Attractive benefits packages are still one of the best ways for a company to attract and retain the most talented people. It can sometimes be challenging for big organisations to ensure that everyone is aware of the benefits they’re entitled to, so communicating this information effectively plays a vital role in staff attraction, satisfaction and retention. In close collaboration with Hilton Hotels and their communications agency, Mercer, we were asked to design a unique employee communication pack that would generate excitement about the company’s new employee benefits initiative. Our materials would serve as the primary communications vehicle, and they would be made available in every staff room across the UK, so it needed to capture attention straight away, and keep employees engaged with it to maximise understanding of the new benefits programme being launched. 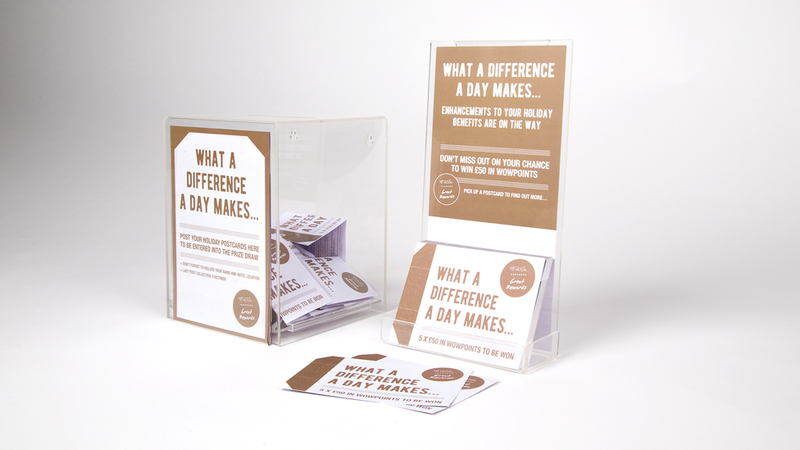 “What would you do with an extra day holiday?” was the theme of our campaign. 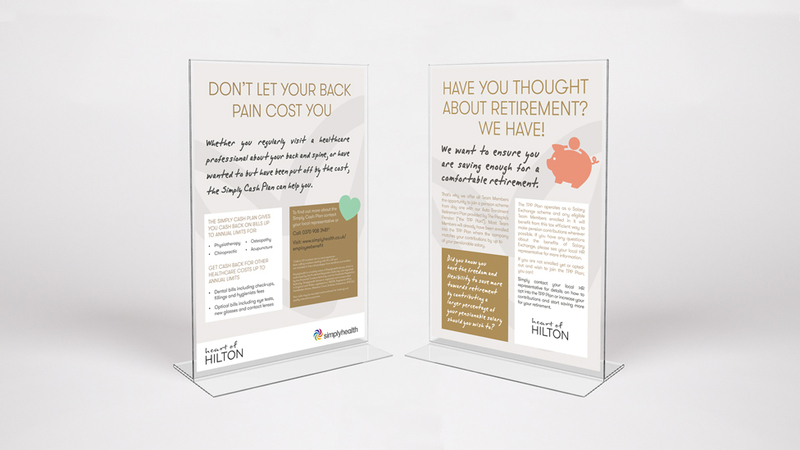 With the company offering six employee benefit programmes to staff in all 80 hotels in the UK, we devised an HR communication that included all eight benefit brand partners, plus the Hilton brand, to showcase our client’s investment and appreciation of their employees. Staff were regularly exposed to the corporate Hilton brand, so we created a fresh way to create differentiation and make the pack stick in their minds, as well as being able to inform employees in a clear and engaging way. The campaign was divided into three stages to maximise interest and encourage participation. First, individuals were targeted by a teaser that encouraged them to contribute their ideas on how to spend the extra day of holiday into a ballot box. The winning idea would receive Hilton vouchers to spend all over the world. 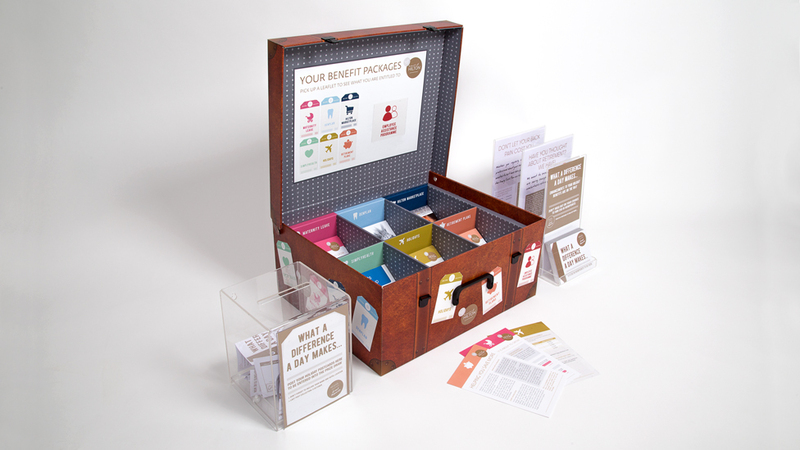 This activity built up to the introduction of the hero of the campaign – a custom-designed employee communication pack that looked like a suitcase. 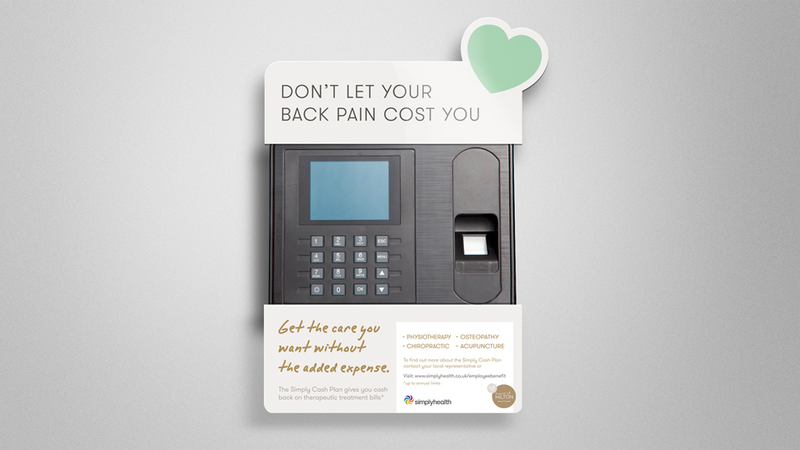 This highly visual format cleverly presented information on all the employee benefit options available, while also creating intrigue and a fun talking point in staff break rooms. Each benefit was outlined on its own “luggage tag” which was colour coordinated to create differentiation, and make the pack fun and appealing. Overall, we produced 80 suitcases, one for each Hilton location in the UK. 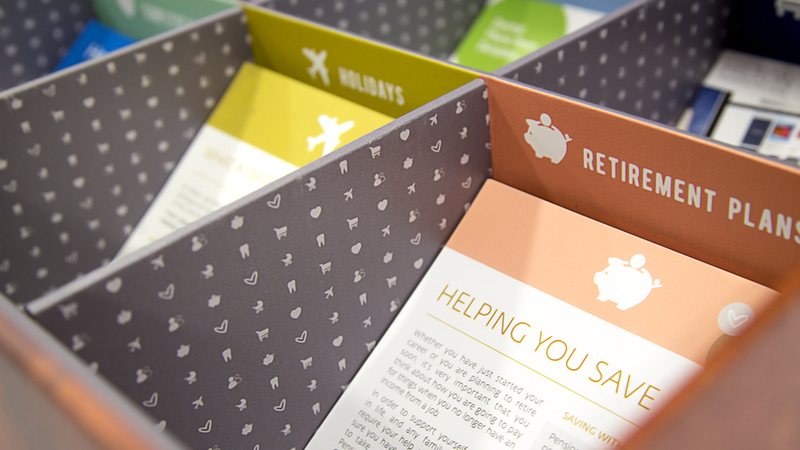 It had 6 compartments, each filled with leaflets detailing the different benefit schemes. As well as devising the campaign and designing the suitcase, we coordinated printing and delivery to all 80 hotels. We also produced table tent cards for each benefit, as well as postcards and display boards to be placed around the clocking-in machines, where different messages would be promoted on a 4-week rotation. The idea was very well received at all levels across the company – from employees to senior board members, who were presented with a mock-up of the design at one of their meetings.